Rutabagas are in season October to March. They also a good source of fiber, thiamin, Vitamin B6, calcium, magnesium and phosphorus. Look for rutabagas that feel heavy for their size with smooth, heavy and firm roots. The skin should be free of major damage although smaller cuts around the top are natural. Smaller rutabagas (4 inches in diameter or less) tend to have a sweeter flavor than larger varieties. Store rutabagas are room temperature for up to 1 week or in an unsealed plastic bag in the refrigerator for up to 2 weeks. Wash rutabagas thoroughly and peel the waxy skin before cooking. 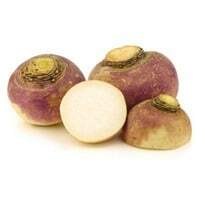 In Europe rutabagas are called swedes. The rutabaga is very similar to the turnip except that it generally has yellowish flesh, a denser root and smooth, waxy leaves similar to cabbage.